Luckily there really are no bad books published about Donald. All autobiographies offer a different insight to Donald's character from the authors perspective. I've listed them in original publication date order, although some books have been reprinted at a later date. To find these books, you may want to try the following bookshops as an alternative to ebay and Amazon. Simon Lewis Bookshop or Chater's, they sell new and old Motoring books, they may also be able to find the book you want! "Donald Campbell was born into the world of record-breaking, as the only son of the legendary Sir Malcolm Campbell, famous in the inter-war years as the ultimate record breaker with nine land and four water speed records. This richly illustrated book provides a unique insight into the life of Donald Campbell, a brave and intense man obsessed with doing better than his father and flying the flag for Britain as the pioneering nation of speed record breakers and leading-edge designers. With much new and rare material, it reveals the record attempts made with his Bluebirds on land and water, capturing the life-and-death dramas played out against the barren backdrop of Lake Eyre in Australia and the verdant hills surrounding Coniston Water in the English Lake District." "This is the illustrated story of the last water speed record attempt made by Donald Campbell in 1966/7. Featuring a diary beginning with his first plans in June 1966, the preparations and modifications to Bluebird K7, the trials and setbacks at Coniston, the unsuccessful speed runs made in December 1966, and the runs over the Christmas holidays, the story is told right through to the attempt on 4 January, where Campbell lost his life. " 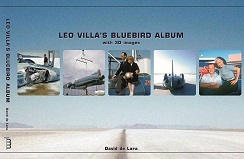 “Leo Villa’s Bluebird Album” is the first work on record-breaking transport history, in which almost thirty full-colour images can be viewed in 3D by using glasses supplied with each book. The story of its genesis is almost as intriguing as its contents. During the past fifteen years, David de Lara, a British-born documentary filmmaker, based in Switzerland, has been collecting archives for two definitive films about Sir Malcolm Campbell and his son, Donald. 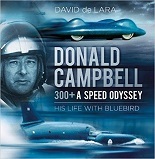 "Donald Campbell: The Man Behind the Mask paints a fascinating portrait of an intense, complex, superstitious yet abnormally brave man, who was driven not only by the desire to prove that he was worthy of the mantle of his father, but also by his fervent and unswerving desire to keep Britain at the forefront of international speed endeavour. This book generates a unique insight into how his deperate fear of failure finally lured him into takin one risk too many." Great book written by David Tremayne. a real Campbell devotee and one of the best if not the best Motorsport writers on this planet! "Here are the life stories of the most famous British record breakers on land and water: Donald Campbell and his father, Sir Malcolm. It is also a story of the triumphs of British engineering between the two world wars - when huge and powerful aeroengines were being developed for the war effort, and ultimately used in peacetime to propel record-breaking cars and boats. While the Campbells take pride of place, the successes and failures of many others are also chronicled here - the dates, times and places - plus the official and unofficial speed records on land, water and even in space. Includes details of the tragic death of Donald Campbell in 1967, and reliable details of the many Bluebird cars, boats and planes built and raced during the 20th century. Complete with an incredible selection of black and white and colour photographs." A fascinating and in-depth assessment of thedevelopment of Donald Campbell's Bluebird K7 Hydroplane. Expressed in both words and unique detailed illustrations. Released by Sutton Publishing From the press release (click here to download the original full version) "This exclusive inside story tells in her own words what it was really like to be married to a man with a great lust for love-making and high-speed record breaking". Criticised for being inaccurate this book has none the less a great collection of glorious photographs. This is a much expanded and updated version of "With Campbell at Coniston" by Arther Knowles, but with details on the recovery and loads of excellent photographs and drawings. You can also download a videoclip of "The final run" from their website. Republished book by John Pearson, originally released in 1965, it has now been reprinted with different pictures from the original. It is John Pearsons personal account of his time spent with Donald at Lake Eyre in 1964. Excellent book. Lithographed version contains details of the lives and boats of Gar Wood, Sir Henry Seagrave, Kaye Don, Sir Malcolm campbell, Stanley Sayers, John Cobb, Mario Verga, Donald Campbell, Lee Taylor, Ken Warby and Craig Arfons.